The Par 3 Shootout Golf Tournament has raised over $1 million for ALS research at the ALS Therapy Development Institute. 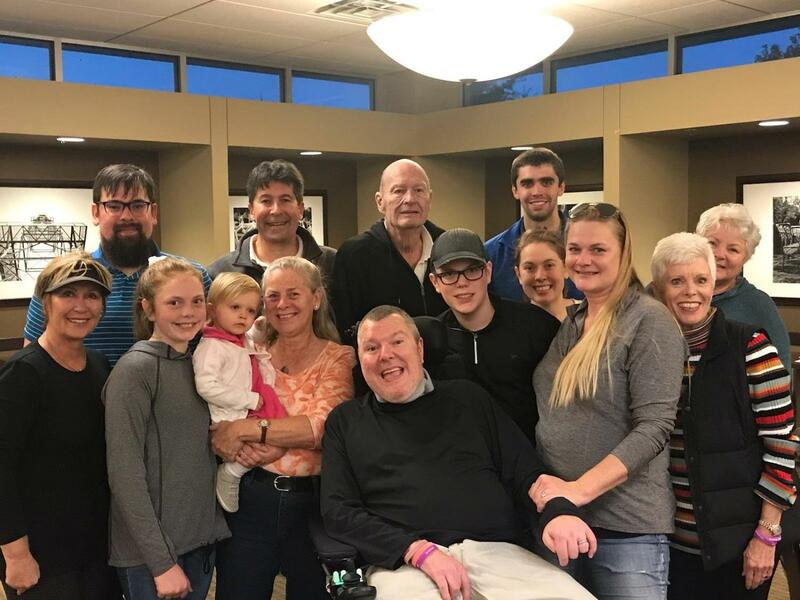 TULSA, OK, November 19, 2018, – Family and friends from across nine states recently gathered again at the newly re-modeled and re-opened LaFortune Park Par 3 Golf Course to celebrate what can only be described as a “Never Give Up” achievement. Led by Brian Stanfield and Tom Ritchie’s (CPA & Partner, EideBailly, LLP) contagious enthusiasm, the local Par 3 ShootOut Golf Tournament they started with an original goal to raise $500,000 for research at the ALS Therapy Development Institute (ALS TDI), has actually reached $1,000,000 in contributions. This story starts 15 years ago when newlyweds Brian and Janine Stanfield received the most devastating news a young couple could hear. Brian, the next leader of a successful third generation Tulsa based environmental services company, was diagnosed with ALS (Lou Gehrig’s disease) and told he most likely had three to five years to live. Undaunted, Brian and Janine decided to push ahead and live as normal a life as possible with the currently incurable disease. One of the first things the young couple set out to do was to raise funds and awareness for ALS research. Janine, who was a CPA with the local accounting firm Magee, Rausch and Shelton sought out her supervisor at the time, Tom Ritchie – then a Partner with the same firm – for suggestions. Rather than just wish Brian and Janine good luck, Tom grabbed the bull by the horns and led the efforts to create the Par 3 ShootOut Tournament. The first year was deemed a success when the Tourney raised almost $25,000 toward their goal. Thanks to Tom and Brian’s dedication, the little family and friends Par 3 ShootOut Golf Tourney has lasted 15 years, and surpassed $1,000,000 in donations. Brian’s persistence to live as normally as possible has allowed him to oversee all of the events, and places him in an anomaly category of less than one percent of ALS patients diagnosed with the disease. Today, Brian uses a motorized wheel chair to get around and speaks with an ALS accent. However, Brian and Janine still enjoy a wonderful family with two beautiful children who have grown up with, and play golf in the event. Truly, these are blessed results. Unfortunately, the reality of ALS is still never far away. Besides raising donations for ALS TDI research, the Par 3 ShootOut Tourney has also honored other Tulsans who have succumbed to the disease over the years. Mark Mandeville, Harold Givens, Thomas Poole, Dan Carmen as well as any other families affected by ALS have been in the thoughts and prayers of all the Tourney participants throughout. The Par 3 Shootout Golf Tournament is still open for donations. Visit here to make a gift. The ALS Therapy Development Institute (ALS TDI) and its scientists actively discover and develop treatments for ALS. It is the world’s first and largest nonprofit biotech focused 100 percent on ALS research. Led by people with ALS and drug development experts, ALS TDI understands the urgent need to slow and stop this disease. Based in Cambridge, MA, ALS TDI has over 30 full-time, industry trained, drug development experts on staff. ALS TDI is internationally recognized as a leader in optimizing preclinical models of neurodegeneration for clinical translation, and partners with pharmaceutical companies and biotechs around the world. Rated a CharityNavigator.com four-star charity, ALS TDI spends 87% of each dollar raised on research to find an effective treatment and cure. Visit www.als.net.